Citizens' Band (CB) radio began in 1945, just after World War II, in order to provide common folks with a means of both fixed and mobile radio communications that required only paying a fee to operate. Amateur radio (Ham radio) did and still does require that the operator pass a written test to gain transmitting privileges (anyone may receive a signal). CB was and is used for both fixed base and mobile communications. Evidently, by 1964 there was enough use and misuse of the airwaves that the Federal Communications Commission (FCC) found it necessary to publish and enforce a new set of rules for users. CB radio began operations in the 460-470 MHz UHF band, then moved to 27 MHz in 1958 since equipment could be manufactured in a manner more affordable to a wider segment of the public. There were only 23 channels available up through 1977, when 40 channels became the new standard. I bought my first 23-channel CB radio in 1975 and installed it in my 1969 Chevrolet Camaro SS. At that time, operators needed to carry a license card and pay some nominal amount for it (mine is long gone). In fact, in the early 1970's when I had my first second-hand radio control system, it was also on 27 MHz and required a license to operate. Crappy (noisy) CB radios were famous for "shooting down" R/C aircraft in their vicinity. The FCC opened up a spectrum segment in the 72 MHz band a few years later and that cured the problem. Both CB and R/C (now operating mostly in the 2.4 GHz ISM band) are license-free nowadays. After considering Docket 14843 for some 20 months, the Federal Communications Commission, in a surprise move, adopted it on July 22 with few changes. Docket 14843 substantially alters Part 95 of the Rules and Regulations governing the Citizens Radio Service. The more important "Do's and Dont's" in the new rules are listed below in "quick-glance" capsule format. DO use channels 9, 10, 11, 12, 13, 14, and 23 for interstation communications. Continue to use and monitor channel 9 as an emergency aid channel for travelers; this practice now has "semi-official" FCC approval. DO get a copy of Part 95 of the FCC Rules and Regulations governing the Citizens Radio Service (CB). Note particularly the list of "prohibited" uses of CB itemized under Part 95.83. This section is in sharp contrast with the previous Rules which contained little about prohibited uses but itemized a few permissible communications. DO use your equipment and a different call-sign if you qualify as a member of a duly licensed group activity such as a volunteer fire company, CD service, etc. You are then a mobile unit of the primary licensee. DO follow the new rule limiting interstation communication to five minutes "on" and five minutes "off." This rule does not apply to units of the same station or to emergency communications. DO continue to operate and use your old call-sign after moving to a new permanent address. However, you must apply within 30 days for a new call-sign, and be sure to notify the FCC of your temporary address. DO be prepared to use any CB channel in case of emergency. Part 95.85 of the new Rules permits a waiver of all restrictions where immediate safety of life or immediate protection of property can be demonstrated. DON'T use channels 1, 2, 3, 4, 5, 6, 7, 8, IS, 16, 17, 18, 19, 20, 21, and 22 for communications with stations other than your own mobile units. Interstation communications is now restricted to seven channels. DON'T use CB for hobby communications, i.e., operating your station just to be "on the air." Don't interfere maliciously with the communications of another CB station. Don't test to solicit signal reports or discuss the performance of your equipment with stations other than your own mobile. Don't communicate with foreign "CB" stations. DON'T use your call-sign when participating as a member of a CD, fire, or police auxiliary group. This group may need a new license and should apply for sufficient mobile units to include your station. DON'T circumvent the "five-by five" rule by changing frequency - it is now illegal to shift channels for this purpose. Remember that all stations in an exchange must observe the five-minute silent period. DON'T operate from a new permanent address unless you have filed an application within 30 days after the change of address and simultaneously notified the FCC Engineer in Charge of the Radio District. DON'T abuse the emergency provision. After each emergency use of a channel not designated for that purpose, you must file a notice of such use with the Engineer in Charge of the Radio District. Editor's Note: The new Citizens Band Rules were received only a few days prior to the closing of this issue. Nevertheless, it is evident that before these changes go into effect (November 1, 1964), several petitions and/or court actions will be taken to stall the implementation of the changes. In reviewing the 20-month period since the rule changes were first suggested, it appears that CB has gone a long way to conquer and alter some of its own defects. CB has continued to grow in terms of public interest and public service. Although the staff of Popular Electronics feels that certain rule changes were overdue, the finalized version of Docket 14843 appears to us to be overly suppressive. Unfortunately, many of the filings made by CB'ers in response to the original Docket were unrealistic and painted (to the Commissioners) a poor picture of CB. If you are a CB'er, we urge you to intelligently express your sentiments in original letters to your Congressman and the FCC to support petitions for a rehearing and presentations of new evidence proving the value of CB. 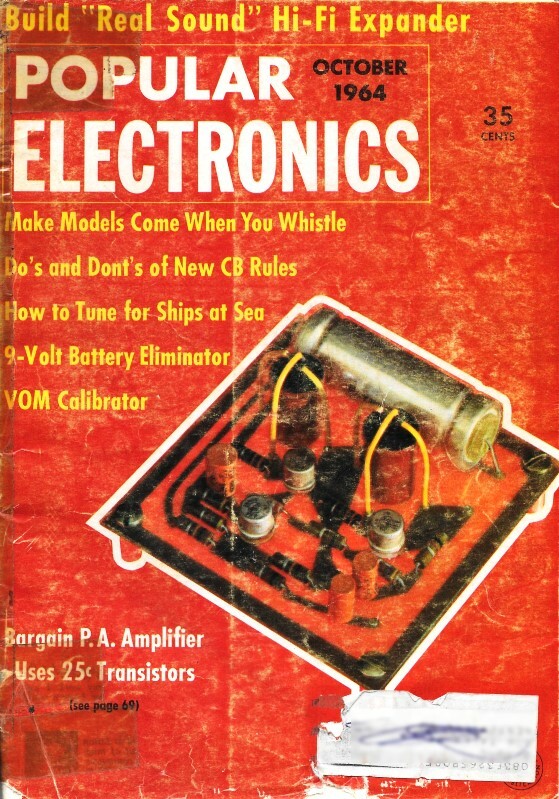 A proposal for the resolution of the "hobby-style" communications problem will appear in the November issue of Popular Electronics.